A donation of $17,500 can build a reading room at a school of your choice. The donation covers the construction of the room (decorations, murals, etc. 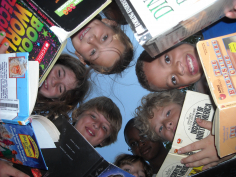 ), furniture, books, an opening ceremony, and prizes/incentives for students who read the most. In addition, you/your company will be recognized at the opening ceremony and on a banner displayed at the school. To learn more about the reading room program, contact Tammy Blazenyak, Reading Room Director, at tammy@carsonscholars.org.